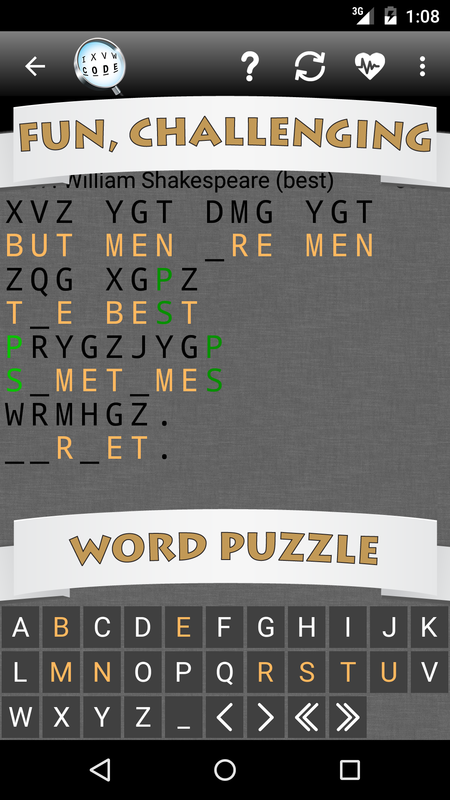 Exercise your mind with our exciting and challenging new word puzzle game, CRYPTOGRAM! 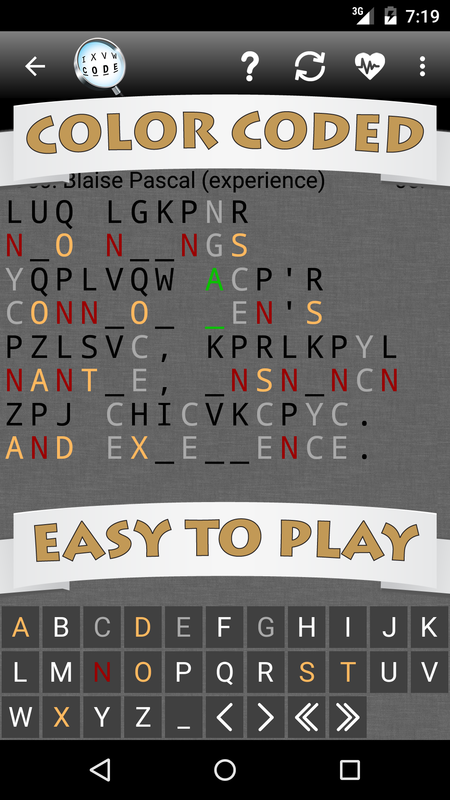 Play the role of a cryptographer tasked with the challenge of breaking an encrypted quote. To play, you must deduce the one-to-one letter substitution to decode the encrypted phrase by some famous (or infamous) author. While the object of the game is simple, figuring out the solution can often be difficult. Keep at it and perseverance will pay off. 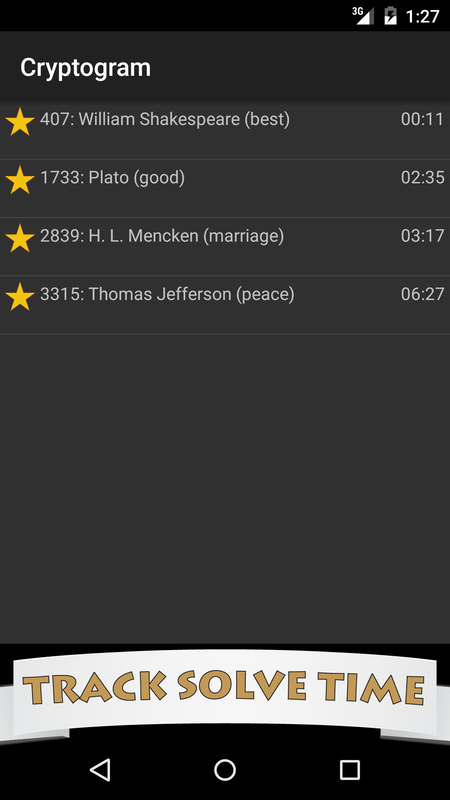 With regular play, we believe you can increase your mental focus, concentration, patience and logical deduction skills, all while learning popular quotes and having fun. 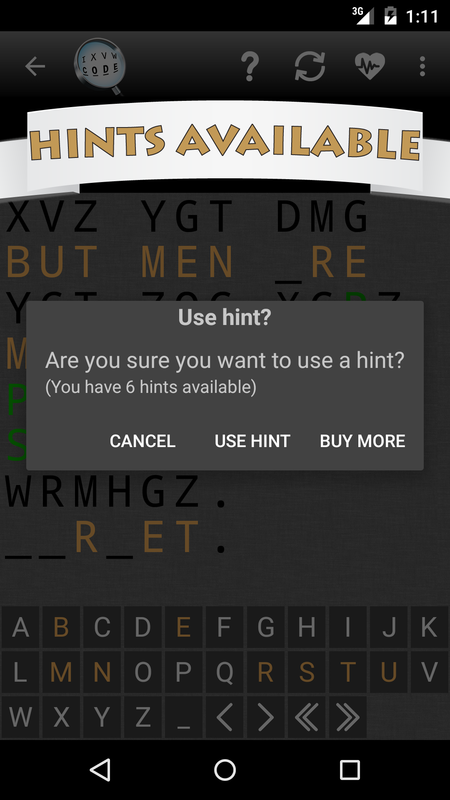 If youâ€™ve never tried a Cryptogram before, the first few games may leave you puzzled, but once you get the hang of it your solve time will decrease and you might just find yourself hooked! 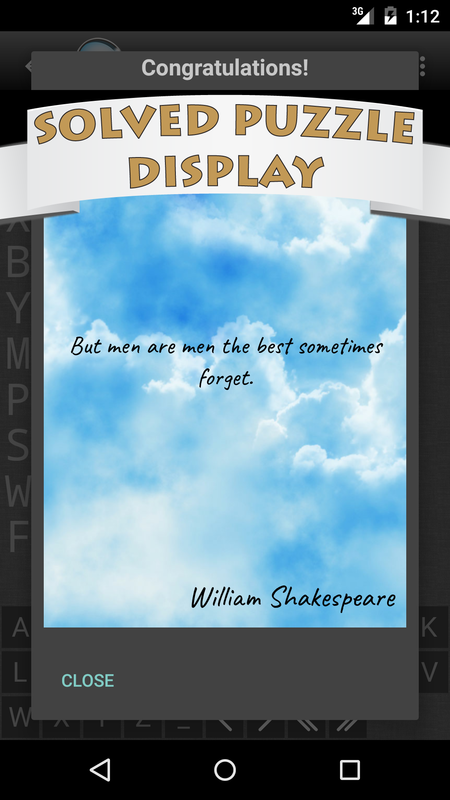 To start you off, we have included an abundance of quotes from a wide variety of historical and contemporary figures, and you can download additional puzzle packs from inside the game whenever you want more. Check back often, as the puzzle library is always undergoing growth. 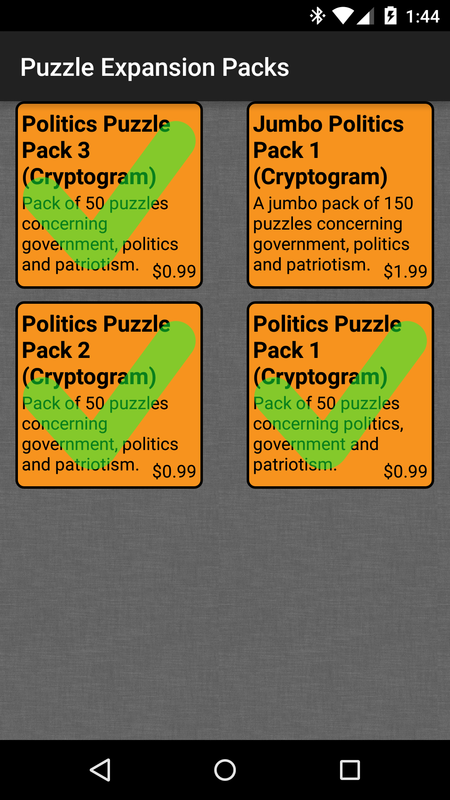 We offer standard-sized puzzle packs of 50 quotes and jumbo packs for the voracious player, which offers 150 puzzles all at once for a reduced cost. Collect them all! 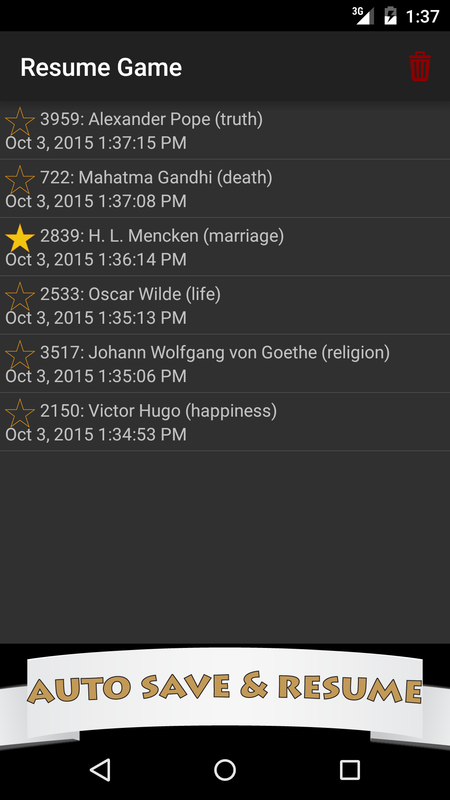 *** Features *** + Free starter pack includes over 200 quotes from 100+ authors on a variety of topics + In-app purchases of additional puzzle packs are available to keep the fun coming + Color-coded letters to assist you in solving the quote or spotting substitution errors + Adjustable text size to fit your preference + Option to allow same-letter substitution to create a truly-random cipher, increasing solving difficulty + Ability to save and resume your progress for an unlimited number of puzzles + Track your best solve times + Play in portrait or landscape mode + Hints to help you when you get stuck (additional available as in-app purchase) + Lifeline to solve the puzzle if youâ€™re absolutely stumped + Navigation controls on virtual keyboard to quickly jump around the puzzle + Hardware keyboard support Studies have shown that engaging the brain in mental exercises helps to stave off mental illnesses such as dementia and Alzheimer's, and, just like physical exercise, regular play is a great way to keep a fit mind fit â€” besides, itâ€™s just plain fun! Try it today!